Worn for days spent outdoors in warm weather, the wide brim of the Victorian Summer Hat is great for guarding yourself against the bright heat of the sun. This white sun hat features a colorful ribbon band for a feminine look. The ribbon wraps around the base of the hat and finishes in a bow at the side of the head. A matching ribbon detail then encircles the edge of the brim for a cohesive and stylish appearance. 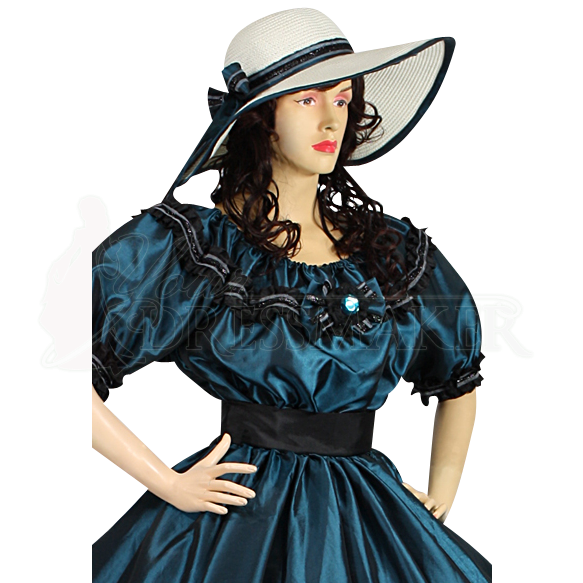 We offer several variations in ribbon color and style to help you achieve a fantastic matching look at your next period reenactment event.